High in fibre, protein and calcium. 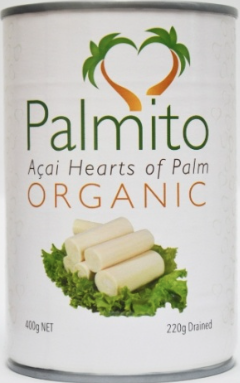 Açai Heart of Palm is the actual heart of the palm, rich in fibre, vegetable proteins and calcium. With their excellent and fine texture and their soft and exotic flavour, Palmitos can add the gourmet touch to your meals: Use them for salads, pastas, risottos and soups. Once you tried them you will find many more uses. Certified Organic by ECOCERT, our hearts of Palm have been cultivated by Afro-Colombian and Indigenous Communities through practices that ensure the sustainability of this natural resource. Nearly 1,200 families benefit from the harvest and utilisation of the Naidi (Açai) Palm.